Neurotic siblings attempt to come to terms with their father's possibly impending demise. 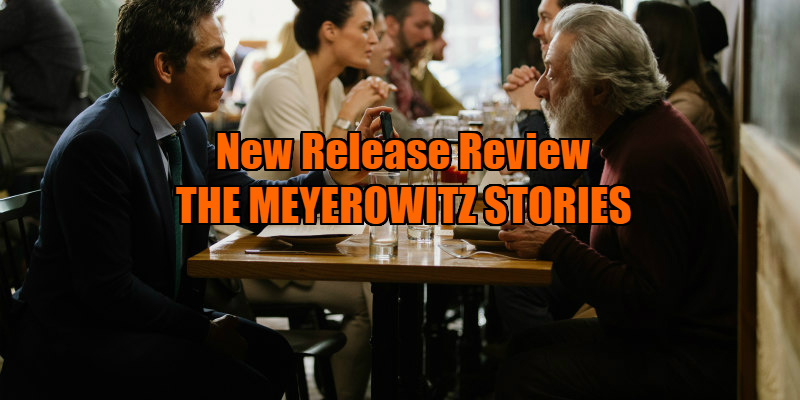 Noah Baumbach’s new film The Meyerowitz Stories proves to be a droll, yet often touching ensemble piece - a character-driven drama/comedy, dealing with family dynamics, dysfunction, daddy issues and sibling rivalry. It will resonate with anyone who has ever had a complicated or awkward relationship with a difficult relative - and who hasn't? The film boasts a rather stellar cast, including cameos by various well-known faces, such as Sigourney Weaver, who makes a brief appearance playing herself. The story concerns a family of neurotic middle-aged New Yorkers attempting to come to terms with the possible demise of their sculptor father, Harold Meyerowitz (Dustin Hoffman). Harold’s eldest son Danny (Adam Sandler), and his sister, Jean (Elizabeth Marvel), were the neglected products of his first marriage, (Harold is on his fourth) while younger son Matt (Ben Stiller), clearly his favourite, was given attention and adulation by Harold and his second wife, Julia (Candice Bergen). Harold is a cantankerous egotist, envious of the success of others, and enabled in his ability to rationalise the lack of acclaim for his own artistic contribution by his children and his choice of wives. Eldest son Danny is humiliated by the fact that he's currently jobless and separated from his wife, the mother of his much-loved daughter Eliza (Grace van Patten), and needs to crash with dad Harold and stepmother Maureen (Emma Thompson) for an indefinite period. He discovers that half-brother Matt, now resident far away in L.A., has drawn up a plan with Maureen to donate Harold's sculptures and sell the New York apartment where they’ve been living. Danny is distressed by this but, as usual, his opinions and feelings are ignored. With each subsequent scene, Harold is increasingly exposed as a difficult, self-centred man and a terrible father. Danny is constantly struggling to be heard and valued, Jean is resigned to being perpetually side-lined by the male family members, and the relationship with golden-boy Matt is soon revealed to be less than ideal. Stiller's Matt is the only member of the family who has eschewed the arts, and the only one to have made money. Having moved to Los Angeles, he has become a wealthy accountant and business manager. Despite Harold’s lauding of his youngest child, Matt rightly suspects that his visit to New York to discuss practical matters with his father will be a disaster. Harold leads him on a merry dance with his consistent tendency to brush aside any concerns other than those pertaining to his own ego or immediate needs. When Harold is unexpectedly hospitalised for a chronic subdural haematoma - the life-threatening result of a seemingly minor head injury that occurred sometime previously - the siblings finally come together in their vigil at his bedside. They begin to thrash out some of their many childhood resentments, traumas, misunderstandings, secrets and rivalries. In a bid to gain their father’s attention and approval, Danny and Jean have set about organising a Meyerowitz retrospective at Bard, a college where Danny’s daughter Eliza is a freshman (making pretentious pornographic art films, to the embarrassment of her relations), and where Harold taught sculpture for many years. During the crisis, Danny, Jean and Matt try to find some kind of resolution with their father and with each other, but inevitably things do not go smoothly. Danny and Matt have a lot of pent-up anger regarding their past. They still vie for approval and feel guilty that they both abandoned any artistic talents they might have had. Long repressed resentments culminate in a cathartic fistfight, moments before the start of Harold's retrospective, where they are both due to make speeches. Hoffman’s performance is convincing as an implacable, egocentric and childish elderly man, obsessed with the petty trappings of status (timely, regarding today’s political climate in America). Sandler, as an unassuming man struggling with issues of self-worth, shows that he can be a convincing screen actor. Marvel is wonderfully dry, quietly making the most of her modest character. But it is Stiller, in a challenging role, who most impresses, going toe to toe with Hoffman and ranging through a whole gamut of emotions. The Meyerowitz Stories is a blackly amusing film about finding only partial resolutions to a difficult past. The story does not quite play out as might be expected - writer-director Baumbach has always had a keen eye for the interplay of relationships, regarding pettiness, humiliations, and small personal triumphs. The siblings learn to view each other in a different light, to accept imperfections and find a new connection, despite their issues with dad Harold - who learns nothing at all. 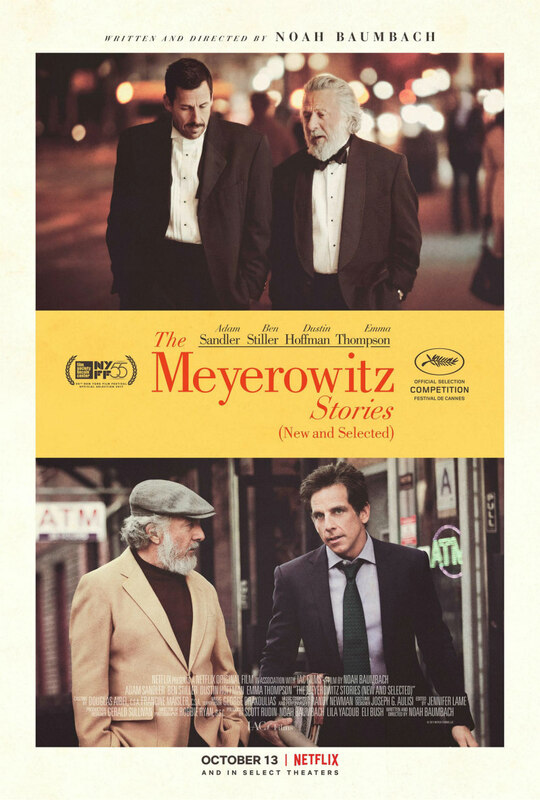 The Meyerowitz Stories is on Netflix October 13th.